Alex Stalock barely remembers his first trip to watch the Wild at Xcel Energy Center. He grew up in South St. Paul, about 15 minutes from the rink, and saw so many games there that they start to blend together. Stalock, however, remembers his first trip to the Xcel Energy Center to play the Wild like it was yesterday. It was Jan. 6, 2015. He was starting in net for the San Jose Sharks, and not even the brutal freezing temperatures could keep the South St. Paul faithful away from the rink. Alex Stalock jerseys could be seen around St. Paul in the hours before the puck dropped, and fans showed up in droves to support the local boy from right down the road. Stalock settled in, however, and thanks to an overtime goal from Marc-Edouard Vlasic, secured the 4-3 win, recording 28 saves in the process. Stalock’s career with the Sharks spanned the rest of that season and part of last season before was traded to the Toronto Maple Leafs, the worst team in the NHL. So, when when Wild general manager Chuck Fletcher reached out in the offseason, it was a relatively easy decision. He signed a one-year, two-way deal, knowing that likely meant he’ll be spending time with the Iowa Wild in the American Hockey League this season. He’s behind Devan Dubnyk and Darcy Kuemper on the depth chart. His family is happy those games will come much closer to home. So is the rest of South St. Paul. Stalock’s former high school coach, Jeff Lagoo, remembers the buzz when news broke that Stalock was coming home. Stalock gravitated to hockey while growing up in South St. Paul, although he never had much of a choice in the matter. It was in his blood. His grandfather was a member of the Packers’ first ever hockey team in the 1950s, and his uncles wore the South St. Paul sweater in the state tournament. That wasn’t always by choice, Alex noted. 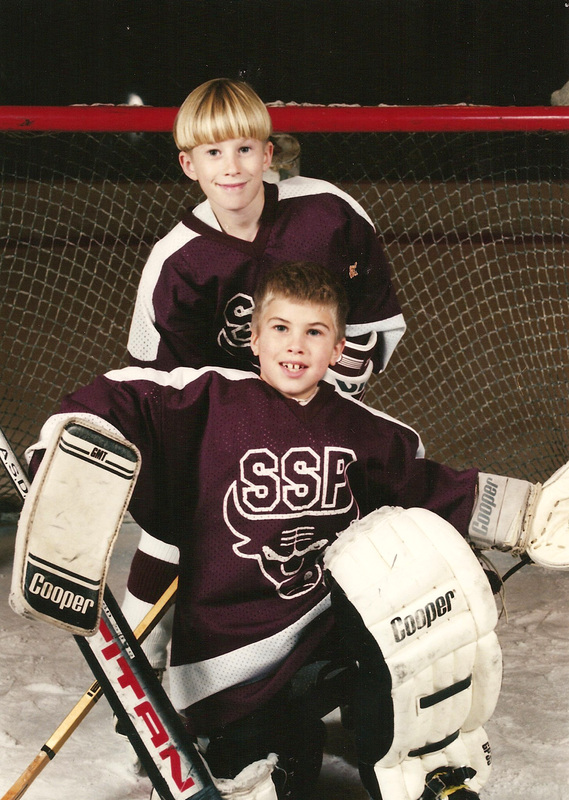 Minnesota Wild goalie Alex Stalock, front, is shown when he played South St. Paul youth hockey at age 7. His brother Nick, in back, is 8. Photo courtesy of Cindy Stalock. Stalock played various positions before settling in between the pipes at the pee-wee level, realizing it was the best position for him. Stalock played two seasons for South St. Paul, leading the team to the state tournament as a junior. He started every game that season, as the Packers made a Cinderella run of sorts before losing to a talented Breck team, led by Blake Wheeler, in the semifinals. For the record, Stalock kept Wheeler off the stat sheet. So much so that Stalock remembers wanting to go home as soon as he arrived in Cedar Rapids, Iowa, after signing with the RoughRiders. “I remember calling my parents like, ‘I’m coming home. I’m not doing this,’ ” he said. His parents agreed to bring him home, but only for the weekend. As the weeks passed, Stalock started to find his niche, even though it wasn’t easy. While his friends back in South St. Paul were at football games, he was at practice. While they were celebrating Homecoming, he was playing games. Still, Stalock said he wouldn’t trade his USHL experience for anything. Stalock was selected by the San Jose Sharks in the 2005 NHL Draft and moved on to Minnesota-Duluth, where he played three seasons before turning pro and becoming a prized prospect. He spent two seasons with the AHL affiliate in Worcester, Mass., before getting the call up to the NHL. He made his official NHL debut on Feb. 1, 2011, earning the win after relieving Antti Niemi midway through the game. After that game he was back to Worcester with plans to rejoining the team a few days later. 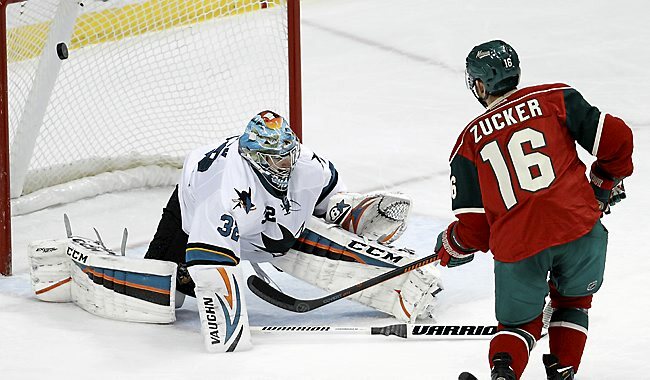 A few days after recording his first NHL win, Stalock routinely covered up a puck near the crease. In that moment, a player tried to jump over a pile of players and landed on the back of Stalock’s left knee with his skate. Stalock couldn’t get up. The nerve that controls movement and feeling in the lower leg had been severed. Stalock missed the remainder of that season, and the entire next season while waiting for the nerve to grow back. “There were doctors telling him not to think about playing again, and he kept asking, ‘When can I get back on the ice?’ ” his mother Cindy recalled. Though he basically had to learn how to walk again, Stalock worked his way through the ECHL and the AHL, yet again, before finally making it back to the NHL. Stalock started in net for the preseason opener against the Buffalo Sabres earlier this week, a moment he had been looking forward to since he signed his contract in the offseason. And while Stalock knows he’s likely to wear the Iowa Wild sweater more often than not this season, he’s OK with it.